Blowing out candles, pin-the-tail-on-the-donkey, spankings, annual bath…everyone has birthday traditions. It’s your day so why not celebrate it the way you want? Me, I like to grab a bunch of my city folk friends and head out into the great wild for an annual event I like to call “Birthday Camping.” We’ve been doing it for years and it is without a doubt, one of my favorite weekends of the summer. 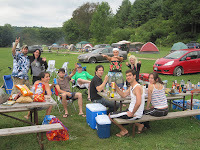 We go to the same location year in and year out, Skinner’s Falls Lander’s River Trips. 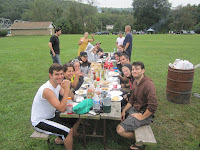 The gorgeous site is well maintained and cleaned sitting on the NY state side of the banks of the Delaware River. 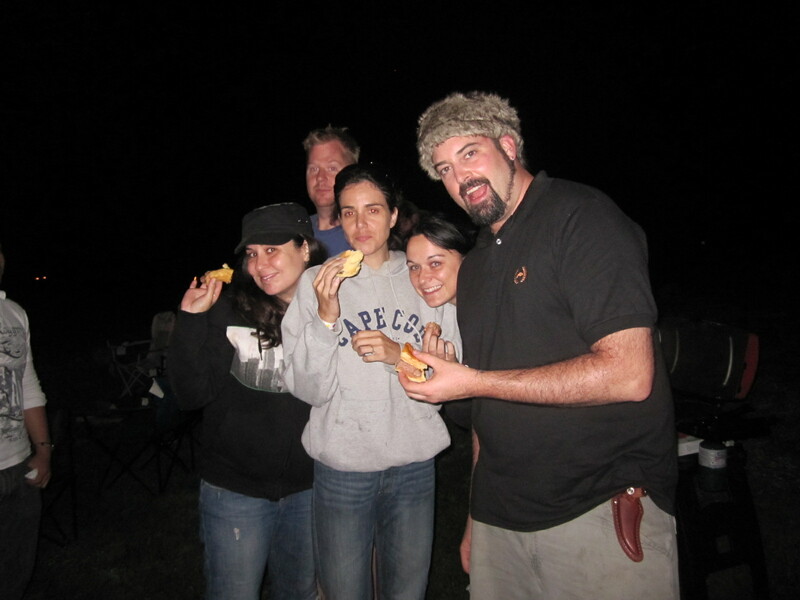 The staff is friendly, the view is fantastic and there’s no cell phone service. What makes this location so good is their river trips. 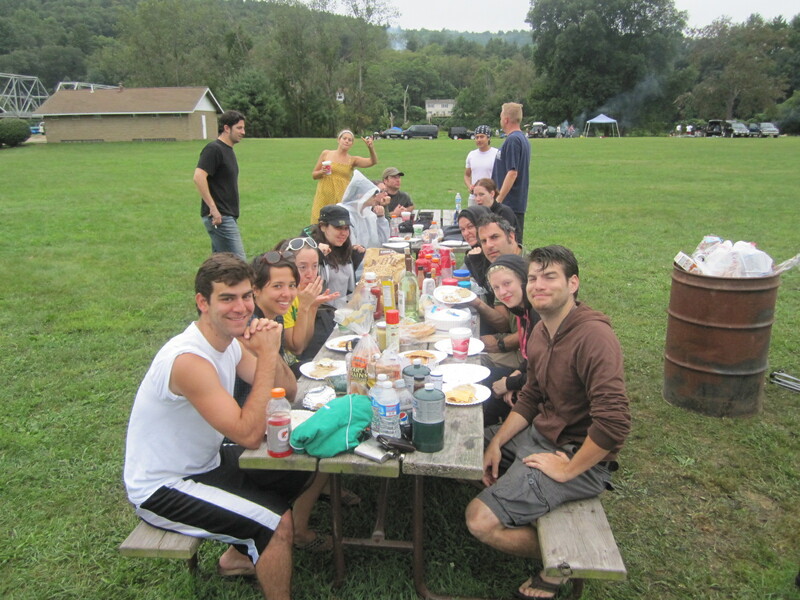 Because the camp site is next to the river, canoeing and or rafting is done by nearly everyone who stays there. Boats leave from behind the main lodge and can be picked up at several different points along the riverbanks. They provide return trip transport which means if you’re like us, there’s a lot of beer drinking on the river. Once we return to the campsite, the fire pit is started right away followed by the grill. We are eating or drinking nearly every moment of the trip. 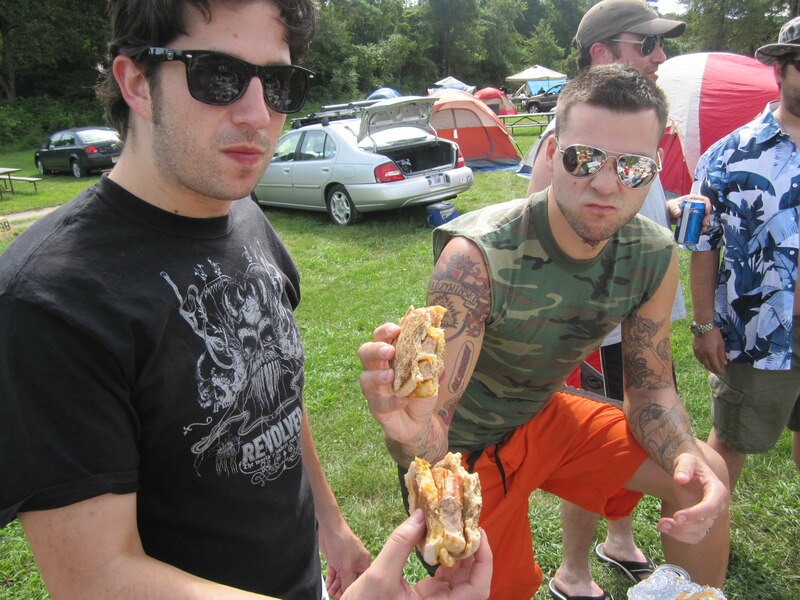 Which, in a way, isn’t that different from what we normally do in the city on the weekend except we sleep in tents. 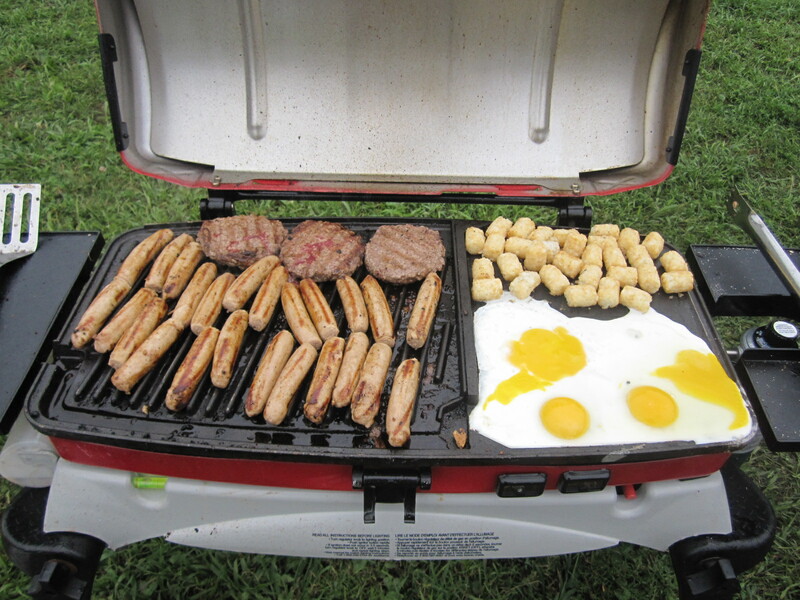 As the master of ceremonies, I organize the whole trip including booking sites, grocery shopping list and manning the grill. 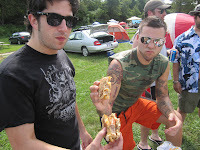 We share everything so there is always interesting grill treats to be eaten. 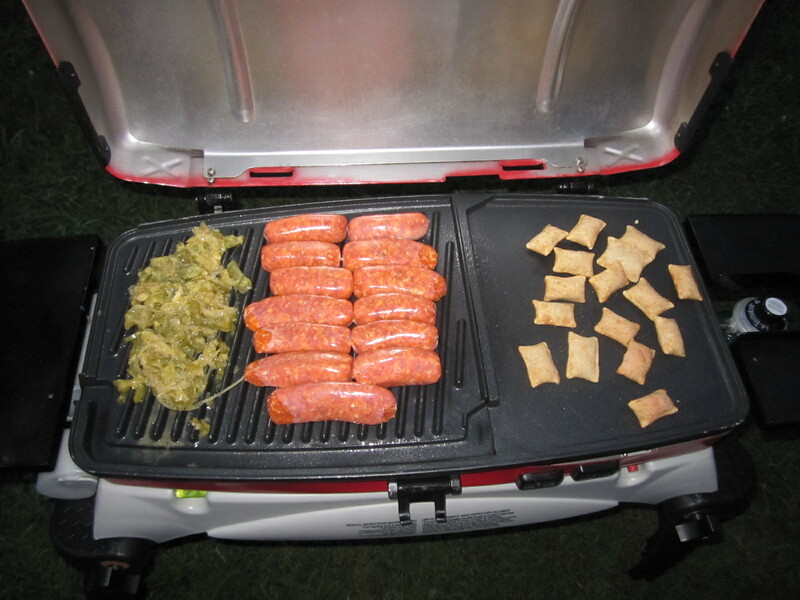 I’m somewhat of a grilling guru and take pride in my ability to cook nearly anything on a grill. The menu wouldn’t be complete without burgers and because I wanted to write about the trip on Burger Conquest, I made sure we had some worth talking about. 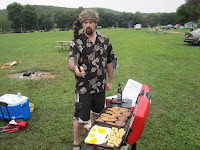 A few days before the trip, I was talking to my new buddy, Jamie Schweid from Burger Maker about food to be served while Birthday Camping. Jamie suggested we try out a couple different Burger Maker blends and report back what we thought of them. 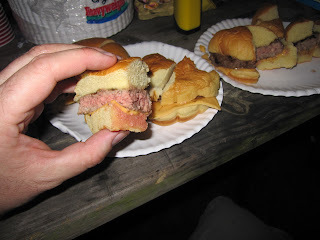 I first tried the Burger Maker patties at George Motz’s “Brooklyn Burger n’ Beer Garden / NYC Food Film Festival,”so I knew they would not disappoint. 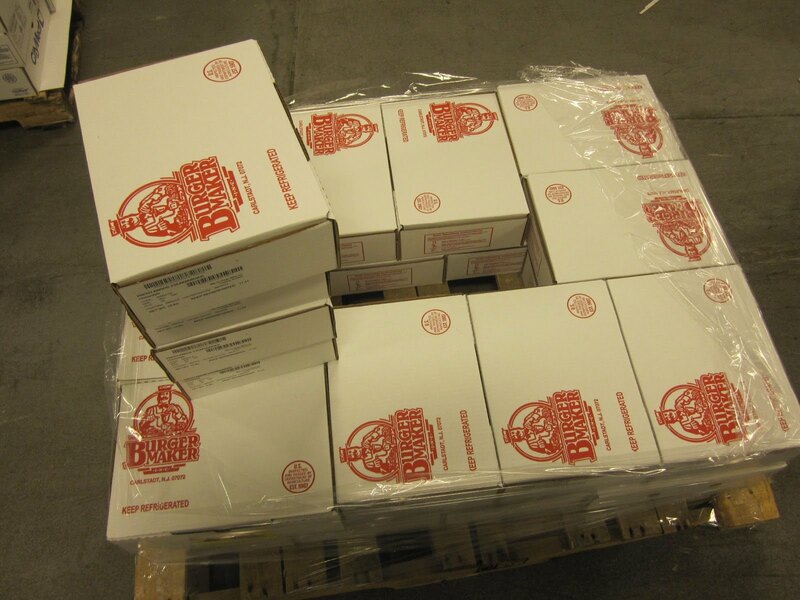 On the morning we departed for the trip, John from Burger Maker arrived at my house with several boxes of the Burger Maker Patties. Upon arrival to the site, we set up what we refer to as “tent city” and as soon as the tents are up, I fired up the grill. 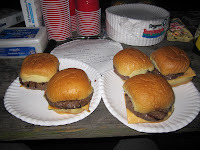 I knew everyone was hungry so rather than whip out the Burger Maker patties from the get go, I figured I should give everyone a little appetizer to settle their stomachs. 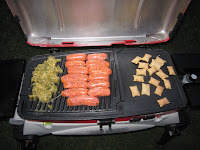 First on the grill, sausages, marinated onions and peppers and pizza rolls. 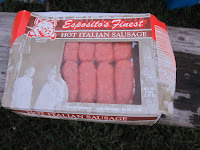 I started us off with some delicious hot sausages from Esposito and Sons in NYC. 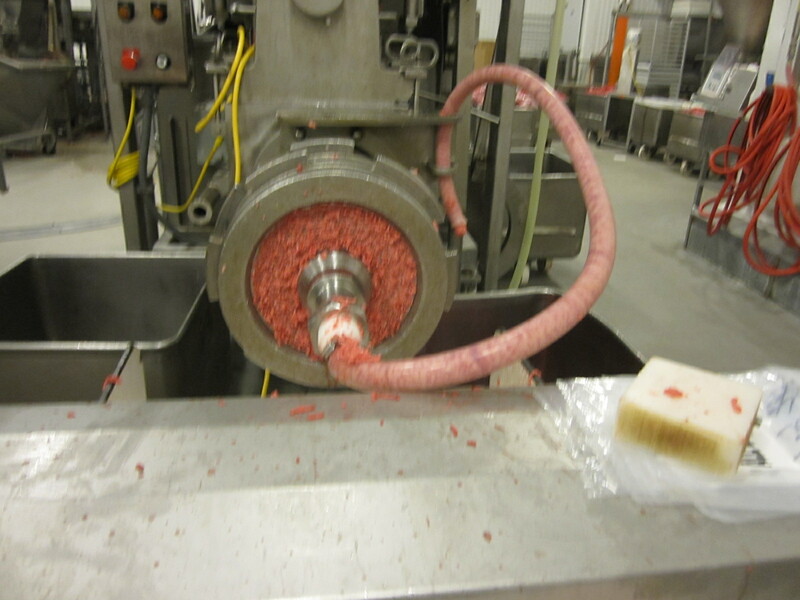 They’re sausages are made fresh in their factory located in the Hell’s Kitchen section of Manhattan. 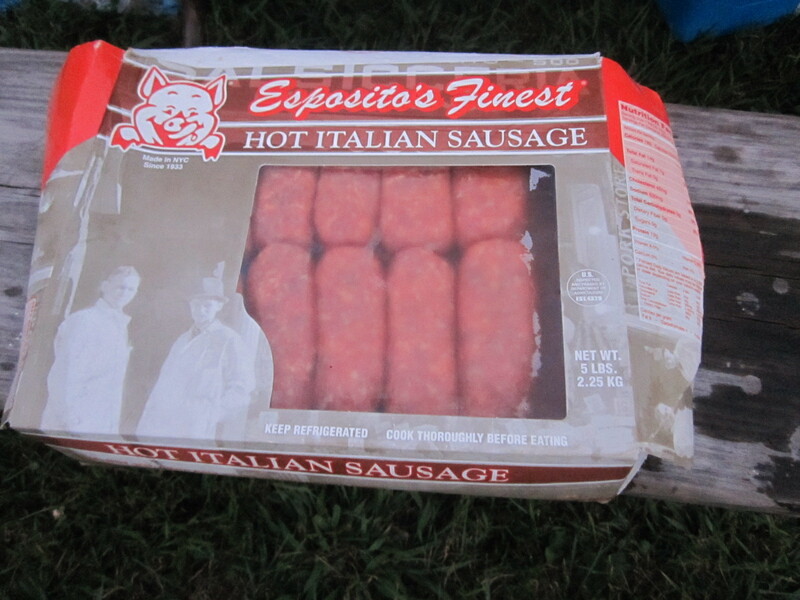 I dare you to try to find better quality sausages than Esposito and Sons. You won’t. They’re my favorite sausages and with the factory conveniently located a whole block away from my apartment, I am constantly stopping by to pick some up. 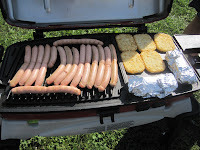 Morning of Birthday Camping, I walked over and picked up a box of their Hot Italian and a box of their breakfast sausages. 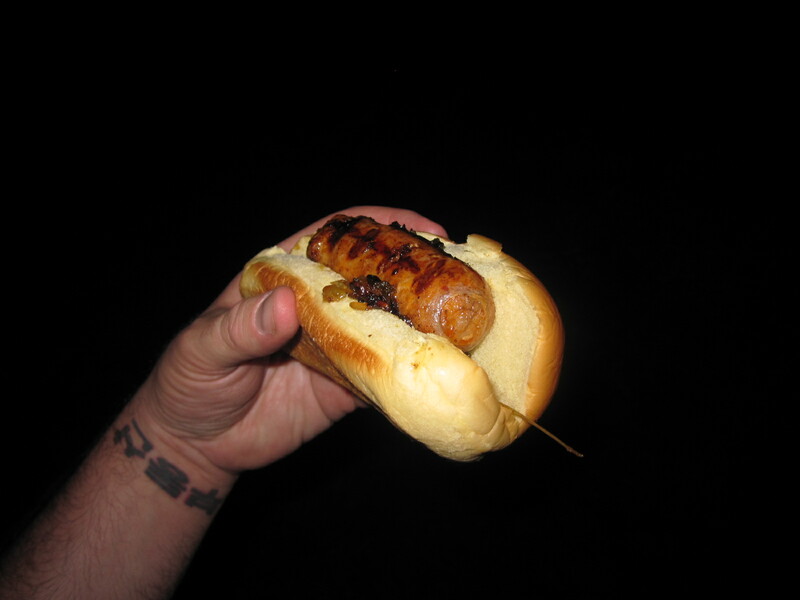 While Esposito and Sons sausages are so good, that they don’t need toppings, you certainly can dress them up. 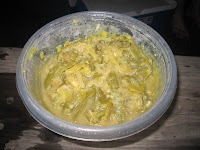 My buddy Brian, a culinary madman, prepared marinated peppers and onions and let them sit over night. When I asked him what was in his marinade he replied “too many things to list. 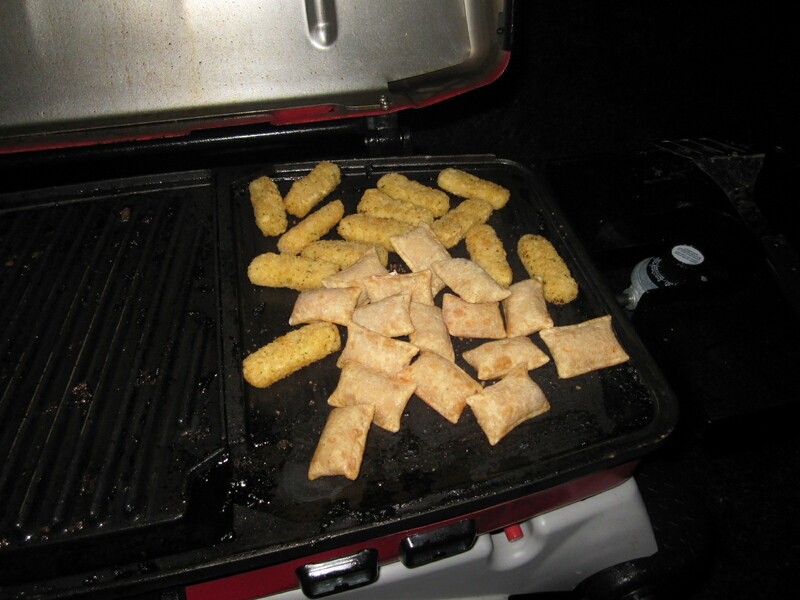 I just started grabbing things around the kitchen and mixing them in.” I couldn’t wait to try them. As a result, the onions and peppers had immense an immense taste which flavors could not be picked out. It was a little sweet, a little spicy and a little savory. When placed over the spicy pork sausages and served in a potato roll, it created a match made in heaven AKA Brian’s kitchen. 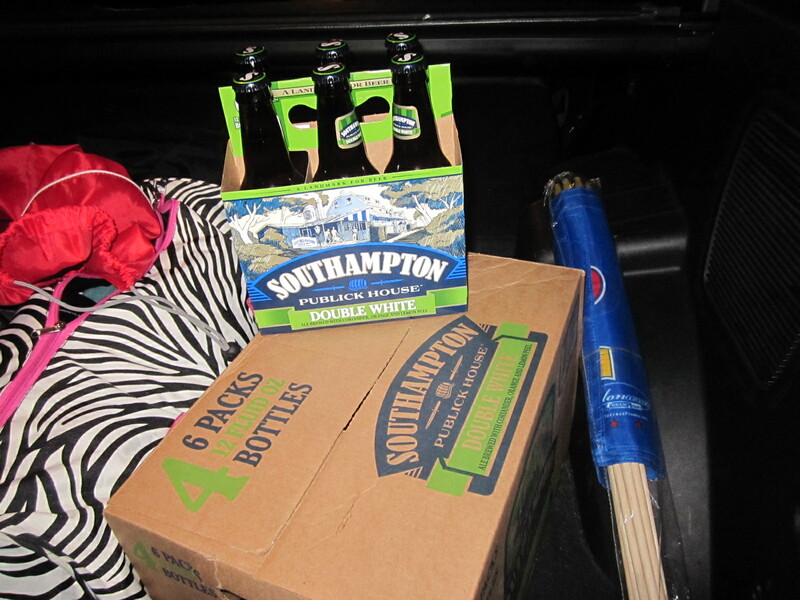 No camping trip is complete without beer. 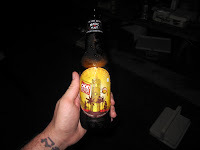 Beer fuels the weekend and keeps the good times rolling. 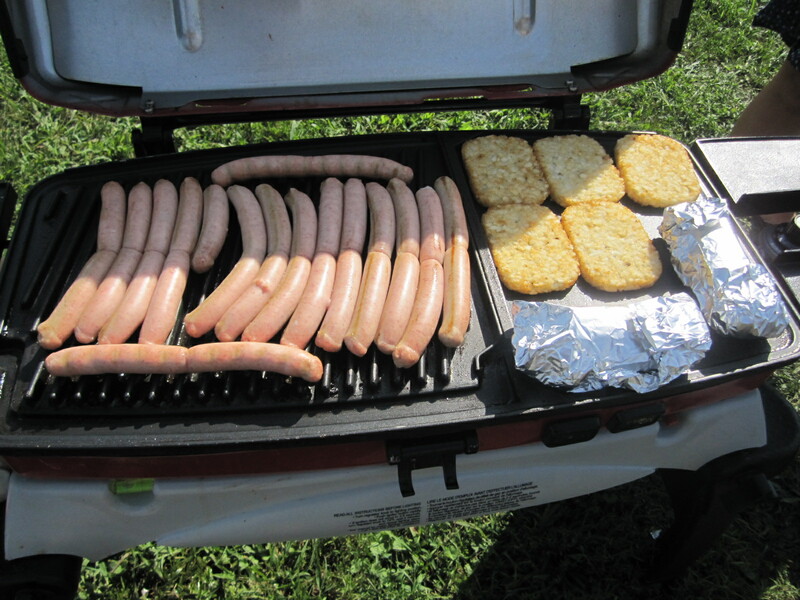 While most people will grab a couple cases of their favorite macro light beer, we always mix in a couple of microbrews to compliment the grilled treats. 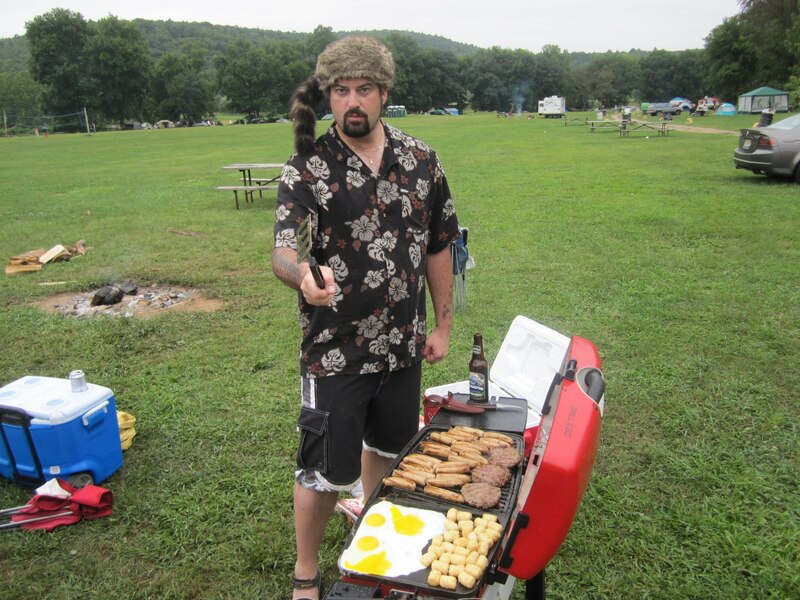 No glass bottles are allowed on the river but not at the campsite! We stared off with the very unique Magic Hat “Odd Notion Summer 2010,” a seasonal Ginger Ale made with Belgian yeast. It’s a little spicy but very delicious. We also had some Southampton “Double White,” a Belgian White style Ale with a slightly sour appeal. 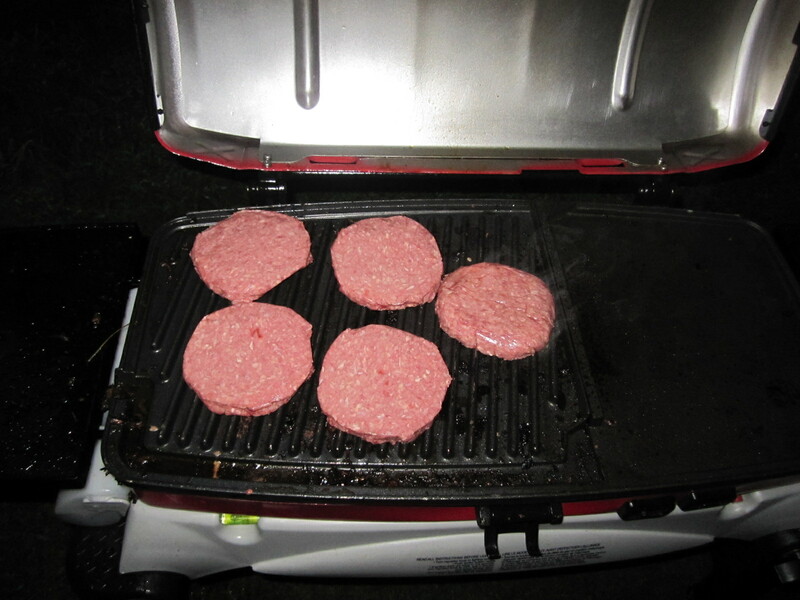 Once everyone’s stomach had been quieted by sausages, I busted out the Burger Maker patties. 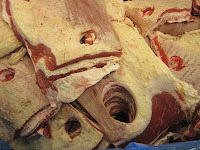 We started off with their “NY Blend,” made from the highest quality steak cuts of beer. It is the juiciest store pre-made burger patty ever and always sold fresh, never frozen. 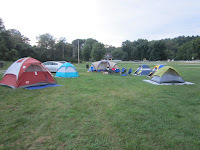 I’ve reviewed them before on the site so I figured rather than be repetitive, I would allow my fellow campers to validate my thoughts with their reviews. 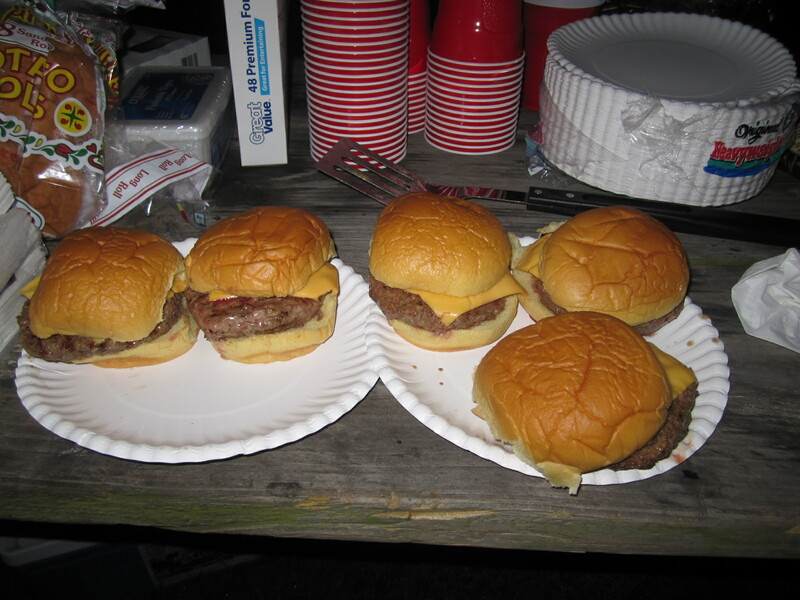 All burgers were cooked medium / medium rare and served on potato rolls with a slice of Velveeta cheese for the extra creamy cheesy flavor. Once we polished off the NY Blend burgers in bite size pieces, I placed the Burger Maker Fresh Natural Angus Ground Beef Patties on the grill. 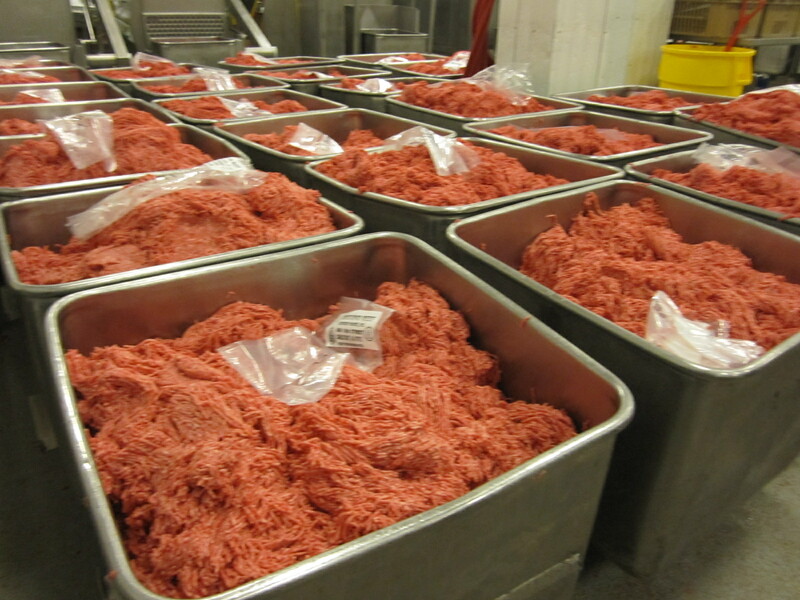 The patties are made using select cuts of prime and choice beef. 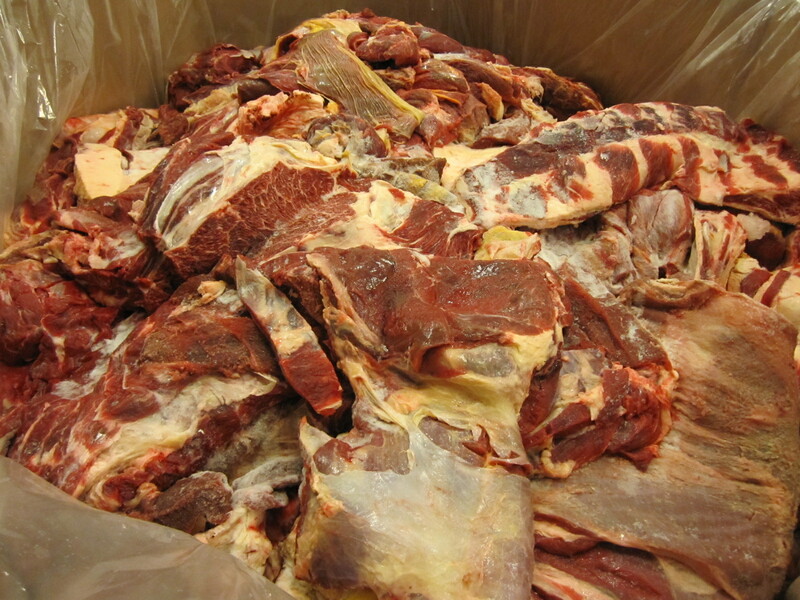 According to them “Our cattle have NEVER been exposed to antibiotics, hormones or steroids ever and is Certified Humane, Raised and Handled. All of our cattle is source verified to the ranch using only DOMESTIC cattle verified to be 30 months or less old. 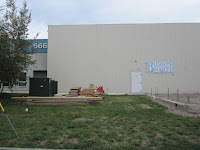 Burger Maker Natural Angus utilizes a network of 250 family farms. Our cattle are fed primarily corn in segregated feed lots. Burger Maker Natural Angus means less water and truer beef flavor.” Sounds great doesn’t it? 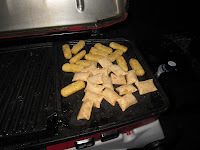 I served them with an appetizer of grilled mozzarella sticks and more pizza rolls. 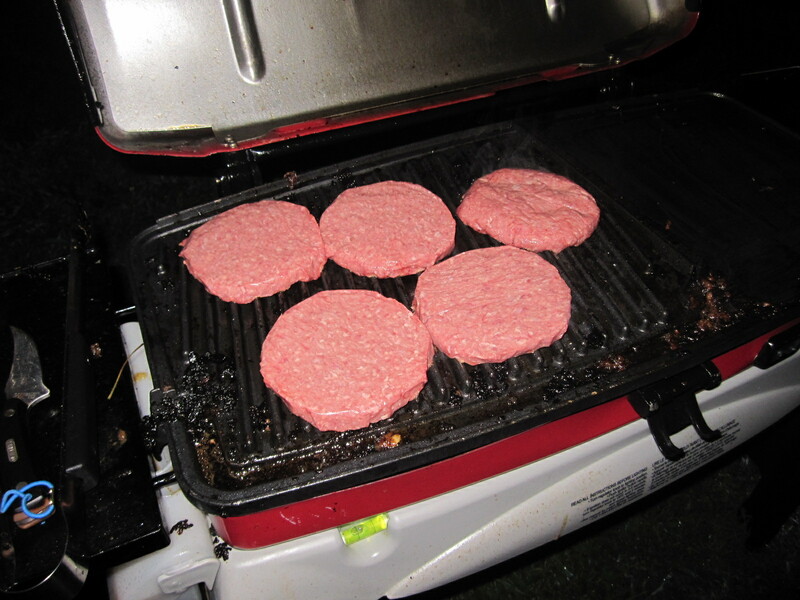 From the smell alone, this was going to be a great burger. 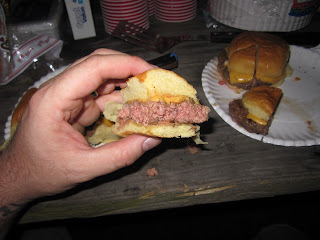 …a Burger Conquest Rise and Shiner. Served between a whole wheat English muffin, my version uses Esposito and Sons breakfast sausage, a grilled egg over medium, a Velveeta slice, a Burger Maker NY Blend patty and pizza rolls. It defines the word “extreme” and intended only for the very hungry person who is well equipped with a mountain of napkins. 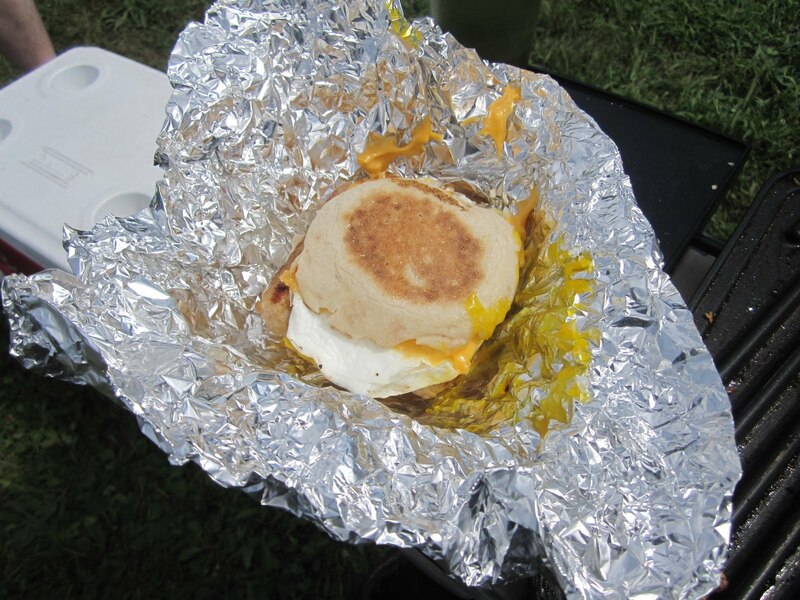 With one bite, the egg yolks explodes forth and makes for an extremely flavorful and messy breakfast treat. I absolutely love the Burger Maker patties. It’s the highest quality and most delicious burger you can serve at home without grinding the meat yourself. It’s juicy, savory and full of real steak flavor. Chances are, you may have had one and didn’t know it. 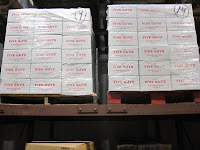 Burger Maker supplies the patties for a lot of restaurants around the country, including Five Guys Burgers and Fries. The patties are created only a few days after the cow has been slaughtered and are sold with a 21 day shelf life. 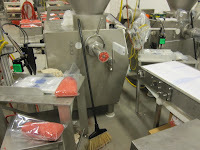 So enamored with the patties, Jamie asked me if I would like to come by the factory and see how they are made. HELL YEAH BABY!! 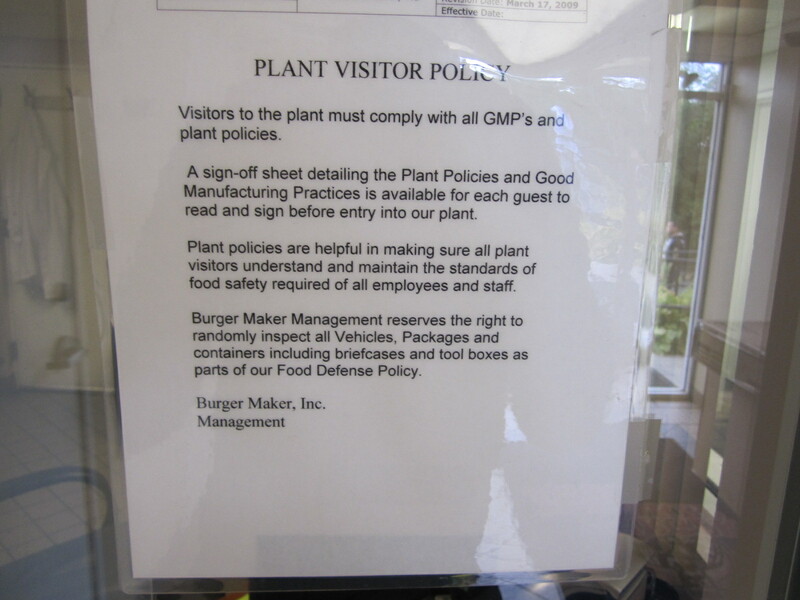 Of course I want to see how Burger Maker makes their patties! Using my Connect By Hertz membership, I rented a car and drove out to Carlstadt, NJ to the factory. I arrived at the factory just as the work team was going on lunch break which gave Jamie the opportunity to show me around at a quiet time in the day. After a quick hello and signing my life away on a waiver, I donned the thick coat, hair net, beard net and gloves required by all people who stepped foot in the plant. I think few people have worn this with as much excitement as I did. 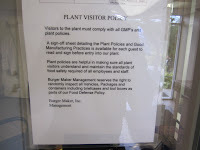 I was so stoked to be dressed up as though I worked for Burger Maker. Also, I needed a new profile picture for facebook! 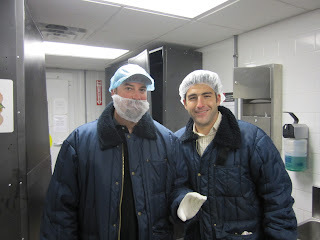 We walked into the plant where there was a significant drop in temperature. All the meat is kept cold so it stays fresh. 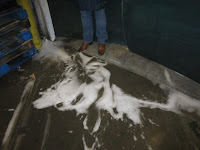 In between each room in warehouse, water with cleaning agents is sprayed so as to not bring outside agents and bacteria into the processing plant. 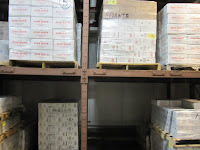 The first room we entered was the daily warehouse. This is where meat is stored before it’s processed. 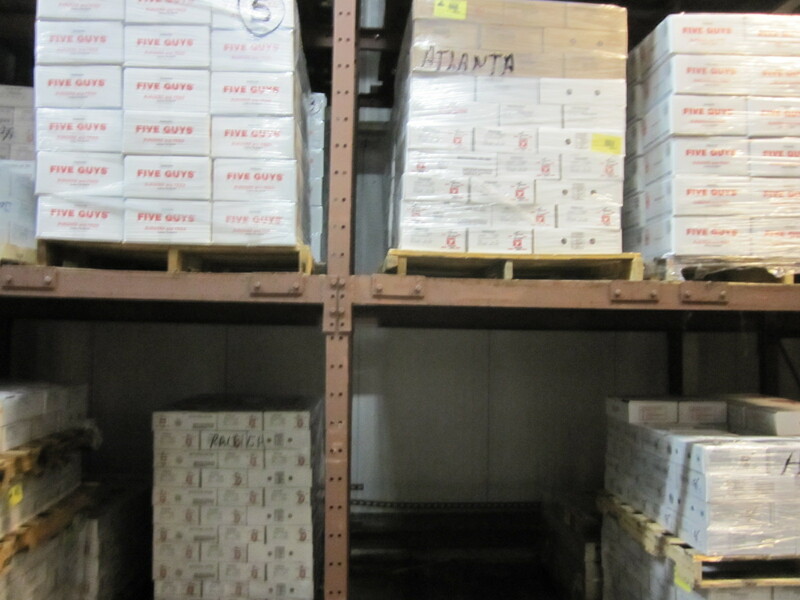 It’s a gigantic room with boxes and boxes of meat. Jamie told me that this room is turned over once a day. From there we stepped into the production room. 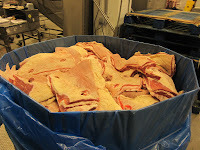 Jamie showed me what the meat looks like before it’s processed. They have all kinds of cuts of beef, all with different intentions. Some is leaner than others all based on the fat ratio desired by the client. 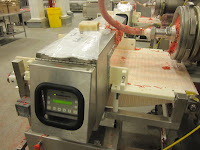 Burger Maker tests the meat several times to ensure quality, freshness and bacteria free meat. 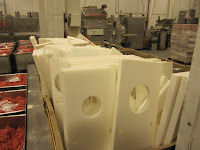 Now realize, I can’t walk you through the whole process of their production. Burger Maker has several proprietary methods and machines used in the factory. 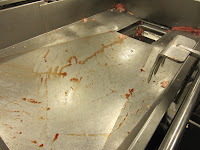 Jamie showed me each and every machine used to make their various meats and cuts. I can ensure you that each and every step is done with precision, care, patience and the highest standards of cleanliness. 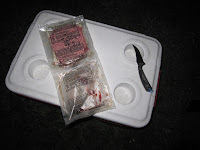 All of their beef product is some of the highest quality available on the market and after seeing how it’s done, I can see why. 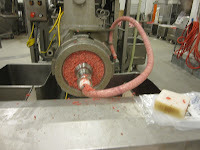 Once the beef has been freshly ground, it’s dispensed in a number of different shapes based on which final product is needed. 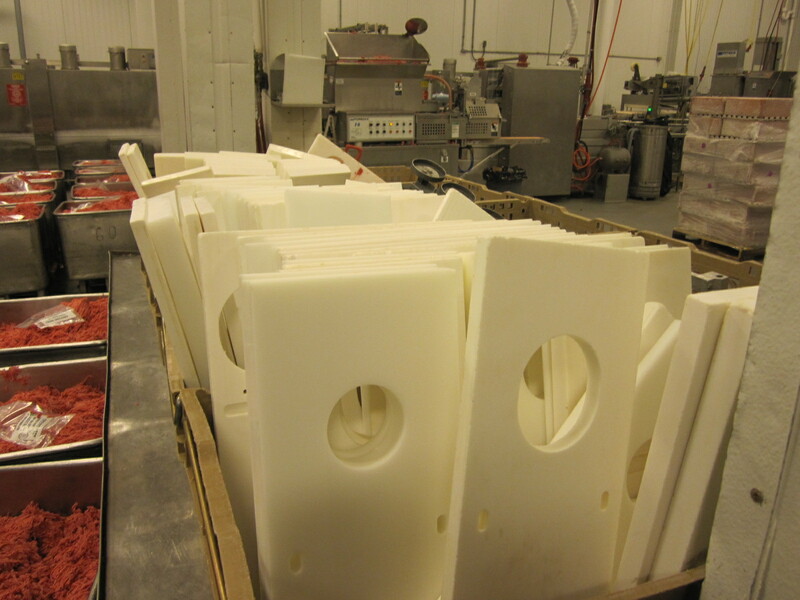 Burger Maker uses a number of die-cut plastic patty forming slabs, some big, some small and even one that makes football shaped patties. 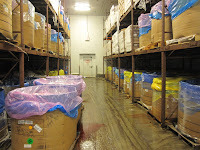 Once the patties have been formed, they are neatly packed into bags and then boxes before moving onto the shipping rooms. Burger Maker has several shipping and cold storage rooms. 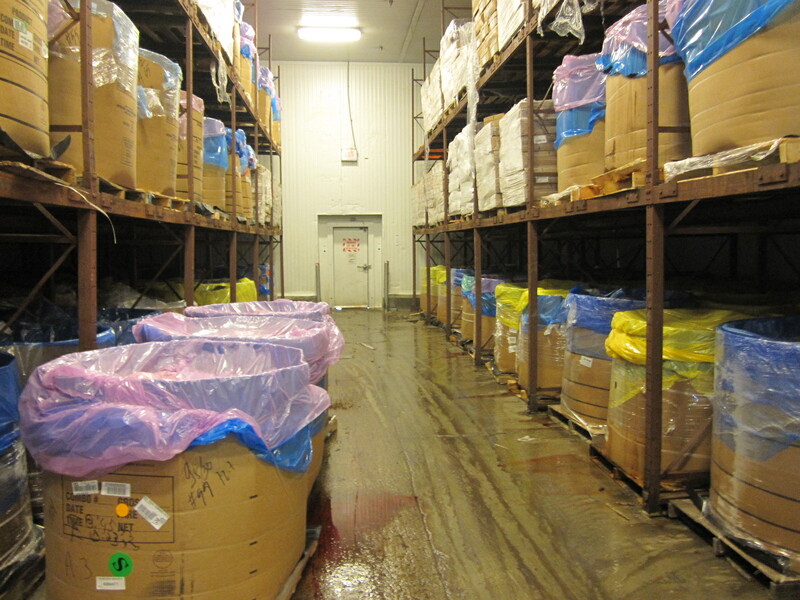 With the massive amount of product they create, there is constant activities with raw meat coming being delivered and finished product shipping out. Their Carsltadt plant ships beef all along the Eastern seaboard of the US. 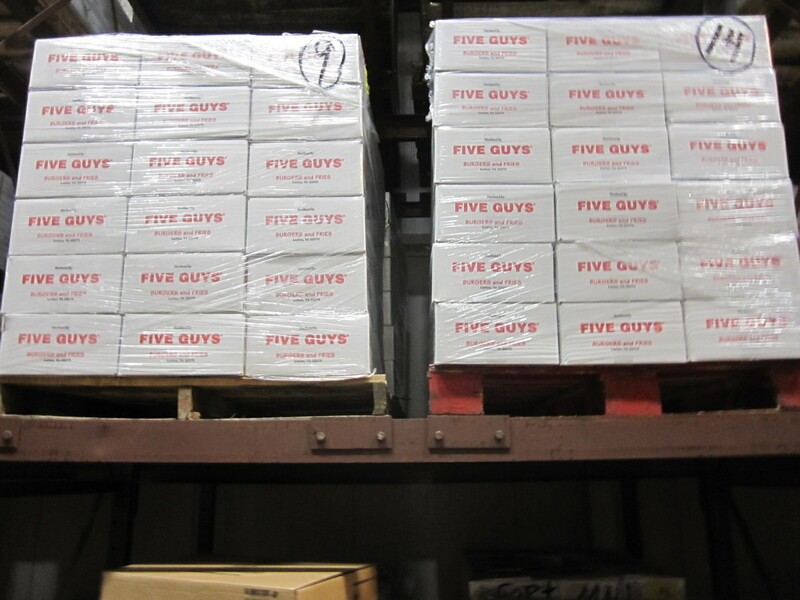 As you walk through the storage you’ll see stacks and stacks of boxes of burgers each marked with the city of it’s destination. 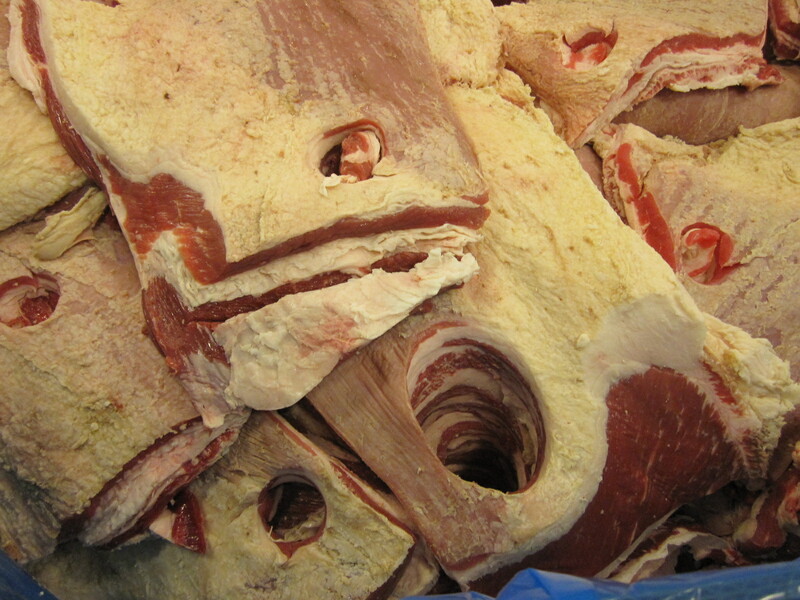 Unfortunately our tour du meat was cut short as a shipping issue surfaced and Jamie had to do some real work. I have never had an experience like this prior and left the factory with 2 things; A. excitement and B. Hunger!! I immediately pointed myself towards the nearest burger joint and bolted off. While Smashburger is not a restaurant that Burger Maker services, it’s one Jamie and I discussed. 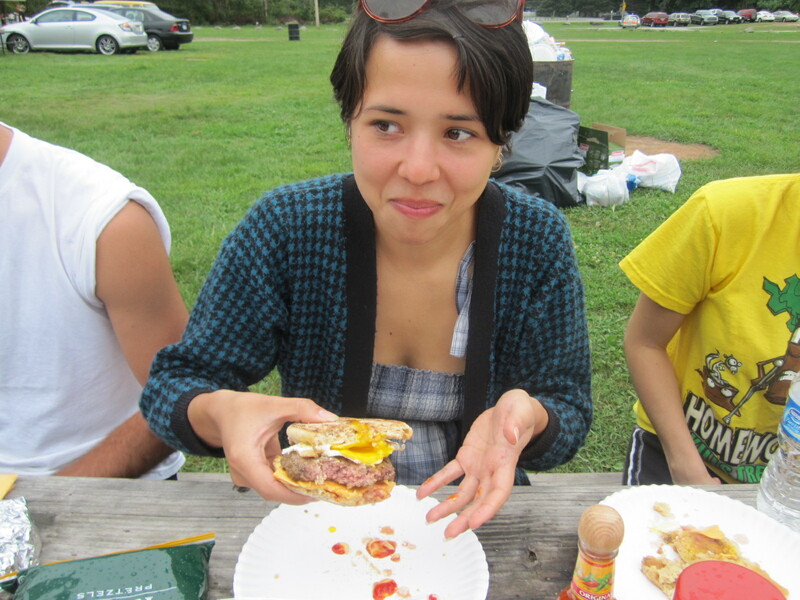 Jamie wanted my thoughts on their burger and who am I to say no?!?! 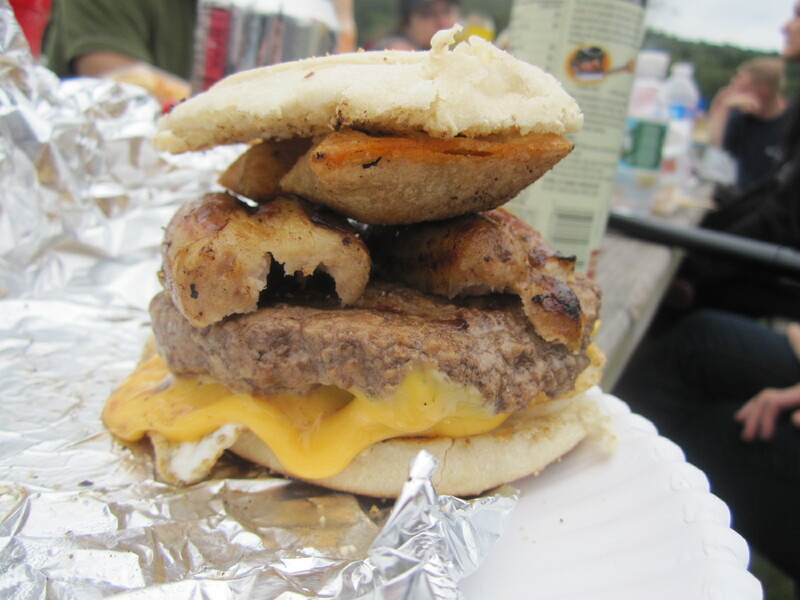 Curious to try these delicious burgers yourself? 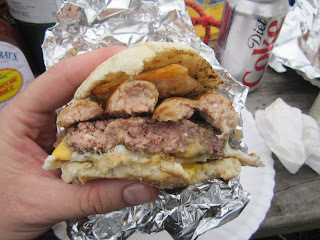 You can order them from FreshDirect or you can just waltz into a Five Guys Burgers and Fries to have one made for you. 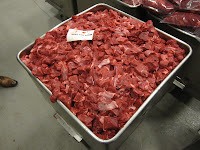 You will instantly note the quality in the beef. This entry was posted in BBQ, Beer, Burgers, Gourmet Burgers, Hamburgers, New Jersey, New York, Road Trip and tagged best burger, birthday, burger conquest, burger maker, Burlington, camping, cheese, ciancio, esposito and sons, five guys burgers and fries, french fries, grilling, hamburger, Jamie Schweid, Kountry Kart Deli, landers river trips, magic hat, nyc, rev, review, Rise and Shiner, southampton double white, the rev meter for social community, VT. Bookmark the permalink. The burgers were amazing – so fresh and flavorful.